Concrete and Walnut Sinks Add Character to a Rustic Barnfrom Seth Taylor, Concrete Designs, Kansas City, Kan.
Infinity-Edge Tub Creates an Indoor Waterfallfrom Jeff Kuryluk, Concrete Encounter, Bridgeport, Conn.
Ammonite Sinkfrom DC Custom Concrete, San Diego, Calif.
Ramp-Style Concrete Sinks Liven Up Locker Roomsfrom Urban Concrete Works, Richfield, Minn. Concrete Bathtub Arrives by Special Deliveryby Stone Soup Concrete in Florence, MA. 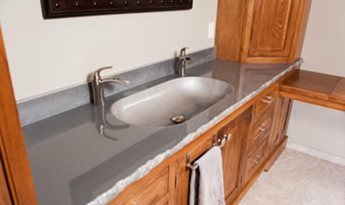 Bathroom Sink, Sills, and Tub Showcase the Many Uses of Concretefrom Trueform Concrete in Flanders, NJ. 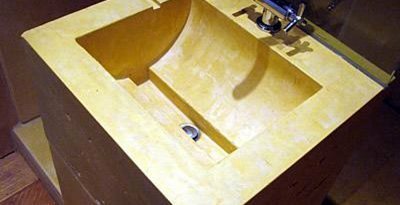 Custom Colored Concrete Ramp Sink and Tubfrom Pourfolio Custom Concrete in San Diego, CA. Bathroom takes on extreme designSubmitted by Silvermine Workshop in Wilton, Conn.